Jo is suffering from a mental illnesses find herself unable to leave the bathroom at work. Is she having a heart attack or a panic-attack? She's not quite sure. Her friend, Sam, also suffering from a mental illness, goes in to help her. 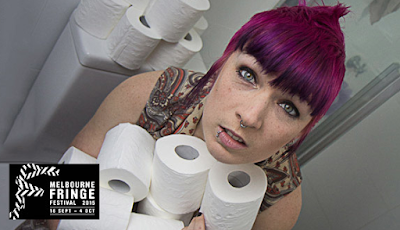 Performed as part of the 2015 Melbourne Fringe Festival, Isobel Marmion's People Piss In Here is an absurdist take at living with mental illness. The exploration of mental illness is explored honestly and sensitively but also humorously through the characters as they react and respond to the effects of their conditions. The fears and uncertainties expressed in Marmions' script (written in consultation with individuals diagnosed with mental illnesses) about living a fulfilled life while battling these, is subtle and reflective. However, the appearance of St. Dymphna, the Patron Saint of Mental Disorders, while adding to the absurdity of the story, detracts from the heart of the story as we are no longer dealing with the sympathetic dynamic of Jo and Sam, but mores with Jo's reaction to having a Saint in the toilet with her and St. Dymphna's origin story. Petra Elliott excels in her dual role of schizophrenic Sam and St. Dymphna, as both characters yearn for an "easier" life through very different means. Jessica McKerlie as bipolar sufferer Jo, has admittedly the more challenging role in the show, but unfortunately she doesn't quite succeed in a convincing portrayal. There are times where an emotional depth and conviction is not solidly present in the delivery of her lines or actions. People Piss In Here is an honest look at how people who suffer from mental illness feel about themselves. While its execution isn't as strong as it could be, it remains a thoughtful piece on mental illness, friendship and living life to its full potential. And always checking for toilet paper first.